Studies of human factors in aviation have progressed significantly since the Second World War. However, the majority of correspondence has been focussed primarily on Pilots, and the perspective from the flight deck. The development of human factors within Air Traffic Control (ATC) has progressed more slowly than similar studies involving Pilot performance. Isaac and Ruitenberg (1999, p.4) suggest that a possible cause of this is the perceived low profile of ATC personnel who, unlike their uniform-wearing comrades, are less visible to the flying public. As the number of aircraft and the demand for ATC services increases, so does the workload of the controller. Hopkins (1995, p.8) observes that “human factors in air traffic control is evolving slowly from a mechanistic to a more socio-technical approach”, focussing more on the dynamics between controller and technology. While fundamental ergonomic issues regarding equipment and workplace design remain important, increasing focus is now being given to the role of human performance (including decision making and problem solving functions), communication, and teamwork. The impact of automation on ATC is also becoming more relevant, as a variety of new technologies are being introduced to help cope with the long term growth of air traffic, with the goal of alleviating stress within already congested airspace. Much of the general population can meet all of the above, yet historically ATC has been a profession which is continually battling against a shortfall of manpower. Hopkin (1995, p.126) suggests that a probable cause is the perceived public image of ATC as a profession that seems to attract blame rather than praise. “Safety is not news, but lapses in safety are”. In fact, there seems to be a clear discrepancy between the “falsified” public image of the ATC profession and controllers’ own perceptions and identification with it. Given the costly investment to train a new controller, a “train for success” philosophy is applied with the purpose of providing the required knowledge and skills to achieve and maintain successful job performance. An ATC training programme usually involves a combination of theoretical and practical components. Trainees typically begin with an instructional course of aviation theory, not unlike that required for a Commercial Pilots License, encompassing such subjects as meteorology, aircraft systems and navigation, with additional components specific to air traffic services. Following this, they commence practical training which often involves the use of a real-time simulator (either aerodrome or radar) with a series of exercises which increase in complexity. The obvious benefits of simulation are that mistakes do not result in collisions between aircraft, and that the exercise can be paused and analysed when needed. Another advantage of real-time simulation, identified by Smolensky and Stein (1998, p.300) is that the same traffic scenario can be presented (with fairness) to different trainees. Simulation provides a cost-effective and intrinsically safe method of training for complex and interactive ATC processes. Some countries without access to simulation facilities will use field training instead. Most countries will use a combination of both. On-the-job training (OJT) commences after the trainee has had a good grounding in basic skills and essential knowledge. Once exposed to the nuances of OJT, trainees will learn quickly the need to be flexible in their decision-making. "They learn that strategies used in training do not always work, pilots are not always easy to deal with, colleagues can also be demanding and most surprisingly the weather can actually change the picture dramatically" (Issac & Ruitenberg, 1998, p.128). The relationship between Instructor and student will be of paramount importance during this time. Patience will be a prerequisite, and the Instructor will have the additional pressure of letting a situation develop for the benefit of learning, coupled with the responsibility of providing a safe and efficient service. The key for the astute Instructor is managing how long to “let it run” while instinctively knowing when to regain control of the situation. Furthermore, training in ATC does not cease with the issue of a licence. Air Traffic Controllers are continually learning about new procedures, leaning new roles and leaning to use new equipment. The act of learning has in fact become integral to the work itself. An ATC environment consists of a vast array of information presented in visual, tactile and auditory form. The mental processing capabilities of air traffic controllers are stated as the primary determinant of their ability to deal effectively with the task demands of the ATC environment (Smolsky & Stein, 1998, p.68). However, it is an oversimplification to refer to ATC as some “uniform global activity” as the cognitive task demands will vary greatly with controller position. 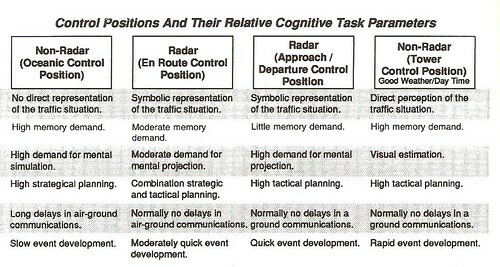 As the above figure shows, the cognitive work of a Tower controller is somewhat distinct from a Radar controller (Approach or En Route) due to the different memory demands and time constraints. For the sake of simplicity, whenever reference is made to “Controllers” in human factors studies, it usually refers to the enroute radar environment as the best approximation, but can usually be applied across all positions. 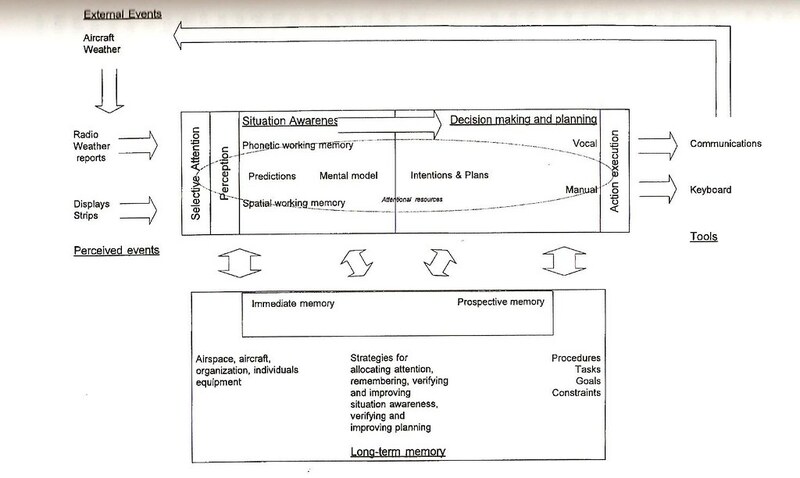 Wickens, Mavor and McGee (1997, p.93) analyse the cognitive task of ATC using a 5-stage model (see below) in which the actions (on the right) are driven by events (at the left). External events include the mix of aircraft traffic, weather patterns, equipment serviceability and unexpected events such as emergencies. The skilled controller must continually scan for new events and selectively attend to the most critical information in a timely manner. Perceptual processes are greatly influenced by long-term knowledge, and may be based on past experience or well-established procedures or protocol. The information presented may be either visual or auditory and a busy controller must use both continuously. Situation awareness has been defined as: “the perception of the elements in the environment within a volume of time and space, the comprehension of their meaning, and the projection of their status in the near future” (Endsley, 1995, p.36). 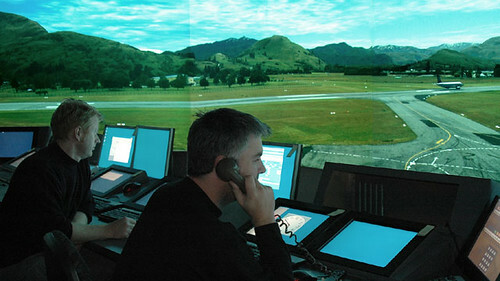 Situation awareness in ATC relates to the controller’s mental picture, often referred to simply as “the picture” or more colloquially as “the flick”. Situational awareness is a product of the controller’s dominant mode of sensory imagery, of their training, and of professional knowledge of ATC procedures, rules and practices. Since the majority of information presented to the controller is visual, and because ATC takes place in three-dimensional space, a fair assumption would be that the controller’s picture would be primarily spatial. However, this is not always the case as experienced controllers may base their mental picture on the time criteria, because time (rather than space) may well be the better guide to the relative urgency of tasks (Hopkin, 1995, p.49). Decision making under pressure is an essential skill for an air traffic controller. Those working in environments with rigid and reducing time constraints such as ATC do not have the luxury of weighing up the options, reducing all alternatives to the very best option. Shanteu (1987, p.208) stated that “although expert decision makers may make small errors, they generally avoid large mistakes. They seem to have discovered that for many decision, coming close is often good enough: the key is not to worry about being exactly right but to avoid making really bad decisions”. The decision-making and planning processes draw heavily on knowledge retrieved from long-term memory. It would seem that experienced effective controllers may not differ greatly from novice personnel in terms of basic information processing. However the experienced controllers may be recognised as accessing a large repertoire of well organised situational information from long-term memory. With reference to Rasmussen’s model of Skill, Rule & Knowledge (SRK ) Model of Decision Making, most ATC decisions are at the skill or rule-based levels in which decisions are made automatically or instinctively. As a method of reducing cognitive effort, controllers may also employ heuristics (rules of thumb) that have worked with reasonable success in the past (Smolensky & Stein, 1998, p.101). While such “pattern matching” strategies of decision-making are commonplace in ATC, they may also have a negative dimension. Maurino, Reason, Johnston and Lee (1995) suggested that the excessive reliance on anticipation was a factor in the Australian Airmiss Study3, raising the likelihood that controllers will rely too heavily on their expectations always being realised when making decisions. Typical actions include maintaining separation by providing clearances to aircraft relating to their heading/track, altitude and speed. The action may be an immediate action, or consist of a strategic plan or series of actions to be employed at a later time. Communication is the most prevalent of controller duties, and the vast majority of ATC communication is via radio transmissions utilising standardised English phraseology. 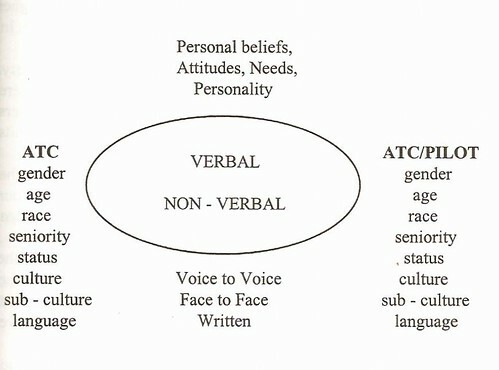 Issac and Ruitenberg (1999, p.135) present a model of communication which highlights the many factors which influence the dynamics of a conversation. Radio transmissions do have some limitations or weaknesses including being vulnerable to error, often ambiguous and subject to congestion and blocked transmissions. Controller-Pilot Data Link Communications (CPDLC or Datalink) is an advancing technology which essentially uses text messages between controller and pilot, instead of spoken word, to improve the accuracy and consistency of routine clearances. To date, the widespread uptake of Datalink communications has been mostly limited to Oceanic control where it is seen as a superior alternative to unreliable HF radio. As a direct replacement to VHF communications it’s future seems doubtful, as many in the industry view the technology as a backward-step, abandoning the nuances and subtleties of voice communication. The qualitative information (as distinct from quantitative information) contained in voice communications is often overlooked when discussing the relative merits of ATC clearance automation. These qualitative judgements will form the basis of action for an experienced controller. For example, whether to speak more slowly and clearly, to seek confirmation that a message has been fully understood, to utilise the more obscure but expeditious reporting points to a pilot conversant with the local area, or to give extra attention to a pilot that seems uncertain. The so-called Livewire facet of the ATC system is of paramount importance to aviation safety, and likely to remain so despite a proposed increase in levels of ATC automation. 3. A study carried out by the Australian Bureau of Air Safety Investigation (BASI), in which the Reason model was used to analyse a spate of 31 reported “airmiss” (serious loss of separation) incidents which occurred during June and July of 1991.